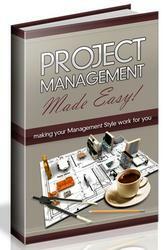 1 In Microsoft Project, open the project plan in which you want to embed the Excel file. 2 Display the location where you want to insert the file. Only the chart area of a Gantt chart and the Notes tab in the Task Information, Resource Information, or Assignment Information dialog box can accept an Excel file as an embedded object. 4 In the Insert Object dialog box, select the Create From File option. 5 Click the Browse button and find the location of the Excel file you want to insert. Double-click the file. The file's path and name are entered in the File box in the Insert Object dialog box. 6 If you want the embedded Excel file to be linked to the source, select the Link check box. If you link the file, any changes to the file in Excel update the embedded object in Microsoft Project. If you try to change the embedded object, you'll see a message indicating that the object is linked, and if you change information, the link will be removed. In this way, the linked information is protected. If you don't link the object, you're essentially making a copy of the original object that becomes a separate entity from the original. You can change information in the embedded version without affecting the source data. 7 If you want the embedded object to be displayed as an Excel icon in your project, rather than showing as part of the worksheet, select the Display As Icon check box. The Excel file appears in the area you selected. Drag to move or resize the object as needed (Figure 17-6). Figure 17-6. The selected Excel file is embedded in the Notes tab in the Task Information dialog box. You can embed an Excel file in a note associated with the project as a whole. First, add the project summary task by clicking Tools, Options, View and then selecting the Show Project Summary Task check box. 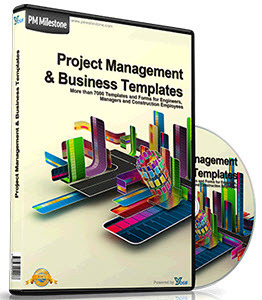 Double-click the project summary task. In the Summary Task Information dialog box, click the Notes tab. 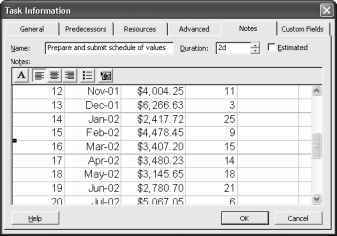 Click the Insert Object button and add the Excel file.